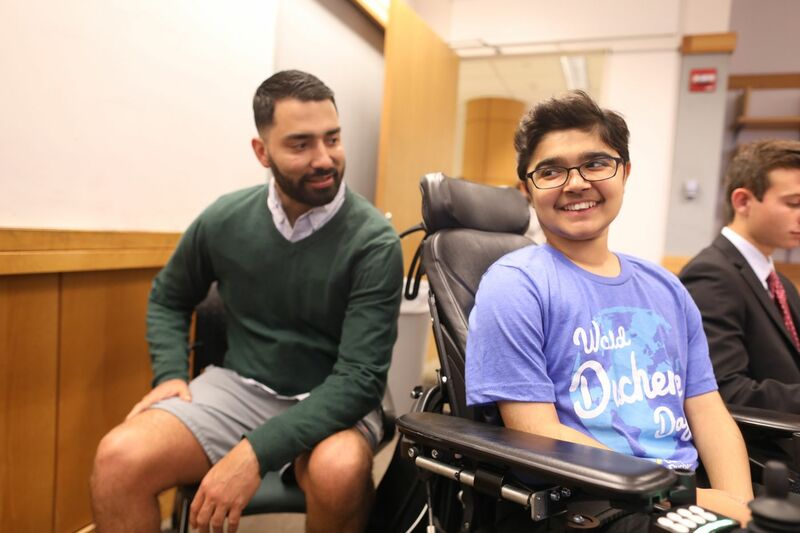 Masterman School junior Yuva Gambhir, right, has Duchenne muscular dystrophy, which he studied in a lab at Penn last summer along with Ph. D. student Leon Morales. They come by the thousands each year for summer programs at elite American colleges — high-powered high-schoolers seeking an early taste of life on campus, many hoping that it will give them a leg up when they later apply to the very same colleges. Yuva Gambhir was among them last summer at the University of Pennsylvania, where he spent a month in a lab studying a grim disease called Duchenne muscular dystrophy. But in addition to having his eye on college, Yuva had another motivation. A junior at Masterman School in Philadelphia, he suffers from the disease he studied. This could be a sad story. After all, this polite, cheerful young man was diagnosed with Duchenne before his fourth birthday, felt his muscles grow weaker by the year, then lost the ability to walk at age 13. Yuva has no time for sad. He is too busy leading an artificial intelligence club at Masterman, playing on the school's state-champion chess team, and spouting Elizabethan verse as a member of an improvisational acting troupe. "We just barge into random classrooms and start presenting Shakespeare," said the 17-year-old, who uses a joystick to maneuver his motorized wheelchair. And while he used to dwell on the unfairness of his disease, now he trains his keen intellect on learning everything there is to know about it. He accompanies his parents, Sonal and Manu, to muscular dystrophy conferences. He speaks at fundraisers. He seeks out news on treatments for Duchenne, even though some of the promising approaches in development may not apply to his case. "I often used to think about 'Why me?' " Yuva told an audience at a fundraiser in 2017. "I realized that true disability is just giving up on what's important and just not trying anymore." During his stint at the Penn lab, he researched the genetic underpinnings of his disease, guided by two scientists who understood his situation as few could. One was Leon Morales, a Ph.D. student who has a different, milder form of muscular dystrophy. The other was Hansell Stedman, the physician researcher in charge of the lab — who lost two brothers to Duchenne. Penn scientist Hansell Stedman watches as Yuva Gambhir transfers fluid with a laboratory pipette. The largest gene in the human genome is 2.5 million letters long — a critical sequence of DNA with instructions for making a protein called dystrophin. This rodlike protein plays a key role in enabling muscles to move, helping to transmit contractions from inside individual muscle cells as part of a larger, coordinated movement of, say, a person's arm or leg. "Dystrophin connects the dots," Stedman said. But because the genetic recipe for dystrophin is so long, there are more chances for mistakes — genetic typos that hamper the body's ability to make it. That is why Duchenne, caused by a total lack of dystrophin, is the most common of the muscular dystrophies, with 300,000 patients worldwide. Almost all are men, because of the way the defective gene is passed from one generation to the next. Until fairly recently, a diagnosis of Duchenne meant a life expectancy not far beyond the teenage years, as the disease eventually weakens the heart and respiratory muscles past repair. In the late 1970s, Stedman's older brother died at 23, the younger one at 19. They are a big part of why their surviving sibling pursued a career in medicine. These days, advances in cardiac care have helped some patients reach their 30s, 40s, and even 50s, and a variety of genetic approaches are in development. In August, at UT Southwestern in Dallas, researchers reported in the journal Science that they had improved the symptoms of dogs with Duchenne, using the powerful new gene-editing technique called CRISPR. The very next week, in September, Stanford University researchers reported success in treating mice with the disease, injecting the animals with viruses that carried the genetic instructions for a "micro" form of dystrophin. Stedman is in the hunt as well. Though he is a surgeon by trade, spending half of his time performing abdominal and soft-tissue procedures at the Philadelphia VA Medical Center, he also supervises a team of Penn Medicine researchers teasing apart the complex biology of muscle function. That means searching for effective muscular dystrophy treatments, and also looking at muscle from an evolutionary perspective, deducing what the muscle-forming genes must have looked like in creatures that lived more than 1 billion years ago. So when Yuva came to Stedman's lab in July, among his tasks was to help stain muscle cells from jellyfish — a creature whose lineage diverged from ours hundreds of millions of years ago. Yuva also served as a sounding board for a pair of research papers that Stedman's team is writing, helping the scientists to weed out jargon. "Dr. Stedman would read certain sentences, and we all kind of worked together to put them more into vernacular, everyday language," the teenager said. Yuva even made helpful suggestions on writing style. "He replaced a lot of our commas with periods," Stedman said. Yuva first learned of Stedman's lab in July 2017, when he enrolled in Penn's three-week summer program in biomedical research. That course provided a broad overview of the field — cell biology, laboratory techniques, proteins — but students also got to dive deeply into one topic in a "journal club." By chance, one of the options was tailor-made for Yuva: a club that would review the latest research on Duchenne muscular dystrophy. And the club leader was Morales, Stedman's Ph.D. student. Though Morales has a condition called FSHD — a far milder form of the disease, caused by a different type of genetic mutation — he and Yuva immediately forged a bond. "I'm really interested in learning more about what's going on at the molecular level. I obviously know a lot about the symptoms." Morales was diagnosed at age 19 after he started having trouble lifting his arms over his head. Then a varsity soccer player at Hunter College who was thinking of a career as a professional, he shifted his sights to science. Now 29, he remains able to walk but cannot run. Yuva pressed him for all these details, and more. "We hit it off right away," Morales said. "Understanding my disease scientifically has empowered me, and I think it does the same for Yuva." Morales introduced Yuva to Stedman, and they agreed the teenager should come work in the lab this past summer. The scientists were impressed by Yuva's eagerness to delve into why his own body is failing. For Yuva, it seemed like a natural thing. "I'm really interested in learning more about what's going on at the molecular level," he said. "I obviously know a lot about the symptoms." The teenager is back in school now, busy with homework, activities, and raising money for research on Duchenne. On Oct. 13, he plans to speak at a casino-themed fundraiser in Philadelphia, www.cureduchenne.org/blingo, with former Philadelphia Eagle Tra Thomas serving as emcee. Yuva keeps in touch with Stedman's lab, and before long there will be a permanent record of his time there. The scientists plan to dedicate one of the papers to him.